I've brought back a few elements from some past postings. 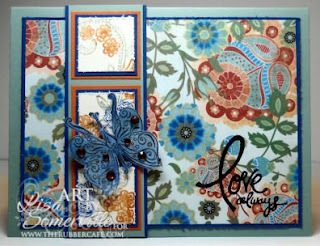 The sketch is last weeks SCS Sketch, the patterned paper is Basic Grey Marrakech. The Floral Swirl image that I used looked a lot like the design in the paper, so I colored it with my markers, then stamped onto my white card stock. I cut the panels to size to work the the sketch. The butterfly was colored with Shimmerz, then I popped on a few Rhinestone Gems in an orange/rust color to pull in color from the DSP. Very cool! love the paper! Very nice, the paper is so beutiful and the 3D butterfly.